If there’s one thing a diverse American sports audience can get behind, it’s beating the Germans—at anything. One need look no further than reports of the word “nazi” or “nazis” being tweeted more than 30,000 times during the course of a the two-hour World Cup match between the U.S. and Germany last Thursday. (I’ve been doing my jingoistic part by running up a sizable Nazi body count in the new Wolfenstein game.) Forget for a minute that most of these innocent German players probably don’t remember the fall of the Berlin Wall, let alone World War II. What’s important is that we licked the Hun once, and we’ll do it again. Because America! But what is the World Cup for, if not mindless nationalist insults? 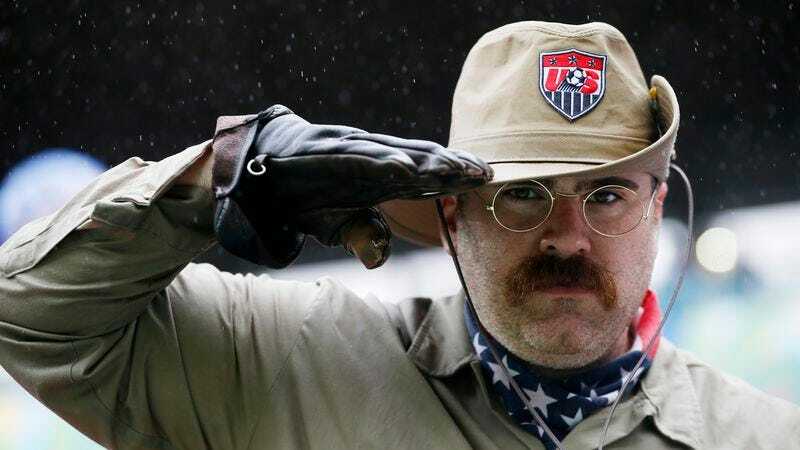 The de facto leader of U.S. soccer fandom in Brazil is, in fact, a man colloquially known as “Teddy Goalsevelt.” This guy—a Chicago ad man named Mike D’Amico—dresses up like America’s greatest mustachioed imperialist president, and, along with Will Ferrell, rallies the drunken American crowds currently milling around Brazil. San Juan Hill or the bar? What difference does it really make, so long as we’re all having a good time? But even this so-called Goalsevelt wasn’t enough when Jurgen Klinsmann’s boys faced off against the U.S. coach’s Nazi countrymen on the Group Of Death’s final day of play. The Germans, it turns out, are as good at soccer as they are imposing fiscal austerity. America’s one hope was that the German team would be content to play conservatively for a draw—a tie would be good enough for both teams to advance. But from the outset, it was clear that Merkel’s Marauders were looking to win outright. Fortunately for the Americans, they would have to botch things good in order not to advance to the next round. The team could still progress in the tournament even if it didn’t win or tie the Germans. The U.S. team put up a strong effort but was ultimately defeated 1-0. Yet thanks to Cristiano Ronaldo and the Portuguese, the Americans will take on Belgium today. It’s time for Teddy Goalsevelt to invade the Low Countries. Uruguay’s Luis Suárez was suspended for nine games after biting Italy defender Giorgio Chiellini during his team’s 1-0 win over the Italians. This is apparently an activity he undertakes with some regularity. In a letter to FIFA, Suarez claimed innocence, stating “I lost my balance, making my body unstable and falling on top of my opponent.” Chiellini must’ve slipped and hit a serrated doorknob. Brazil has a guy named Hulk. That’s not his Christian name, but it is nevertheless the way everyone refers to him. He got the moniker due to his resemblance to Lou Ferrigno. I love South American naming conventions. After the opening round, ties are no longer things that happen in the World Cup. The tournament becomes a single-elimination affair. Instead of giving each team a point for tying, a game deadlocked in regulation will go through two 15-minute periods of extra time, followed by a penalty kick SHOOTOUT. It’s the best—like if NBA playoff games came down to a three-point contest, or baseball games were decided by a home run derby. In the second round’s opening match, Brazil and Chile deadlocked at one goal apiece and lined up to settle matters the old Navy way. In the shootout, Chile fought back from a 2-0 penalty deficit, and it came down the final shots between Neymar and Gonzalo Jara. Neymar made his, Jara did not, and Brazil was spared millions in property damage. It has been a rough few decades for the San Diego Padres, but recent weeks have been especially trying. On June 16th, “Mr. Padre” Tony Gwynn died. In an era of free agency, cheaters, and divas, he was a rarity—a genuine, down-to-earth guy who played the game the right way and stayed on the same team for his whole 20-year career. In a particularly heartwarming moment, Phillies outfielder Tony Gwynn Jr. received a standing ovation from the notoriously flinty Philadelphia faithful. It was a beautiful gesture. Adding insult to injury, Giants pitcher Tim Lincecum threw his second no-hitter in as many years, both of which came against the Padres. There’s no way that happens if Gwynn is still on the team, even at 54 years of age. The guy struck out like five times in two decades. He will be missed. To paraphrase Martin’s character, for some people, El Guapo is shyness. For others, it’s a lack of education. For Wiggins, his El Guapo will be problematic backcourt chemistry and the specter of LeBron hanging over Cleveland until the King decides to go back in 10 years for a meaningless career victory lap. We boycott Belgian ale and all manner of waffles.